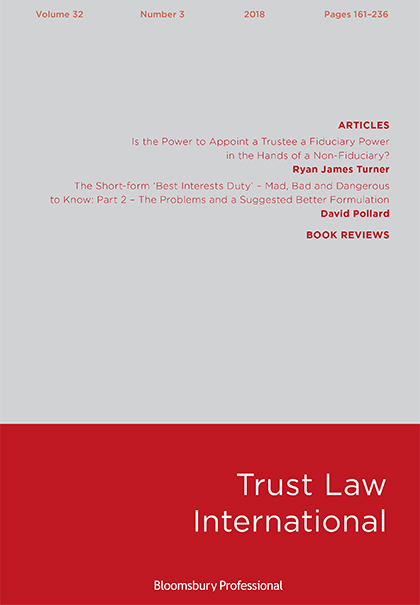 A well established quarterly journal with a mixed readership of academics and practitioners regularly featuring articles, case notes, case summaries and book reviews within the area of both UK and foreign trusts, whilst also embracing related areas such as charities and pensions. Please contact Richard Cox if you require information on submitting articles: Richard.Cox@bloomsbury.com. The Scope of Common Intention Constructive Trusts: Where to Draw the Line? Shell Charities and Terrorist Financing: A Sledgehammer to Crack a Shell?